I will resume posting about the kaleidoscope adventure tomorrow. For today, my hand dyeing adventure. 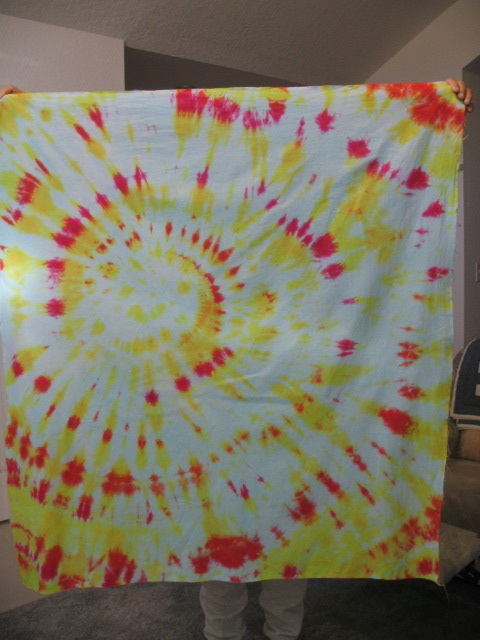 Above left, my first tie dye. Yesterday I over-dyed it with blue. It has to “cure” for 24 hours so above right is fresh out of the washer and dryer. I used a color catcher and Dawn Ultra to wash. I threw in my dye clothes as an experiment. The pants are white (although they have some paint and various other stains on them). At any rate, they are still white, not blue. Below left and right are my first spiral and what I tried to make a low water immersion in light blue. It has none of the veins of darker color I was hoping for so I either used too little dye or too much water. It’s a subtle difference from the white one but enough that I like it. 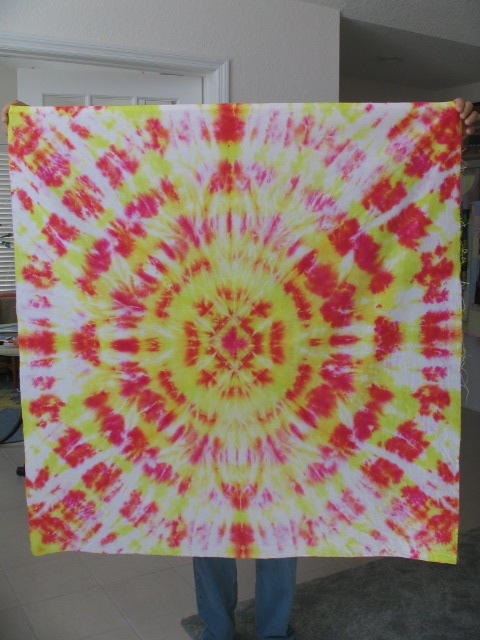 I already have a planned charity quilt using the spiral as a backing. I retired in 2004 and have never missed the 8-5 grind even for a minute. Now I spend my time reading, traveling, quilting and trying to learn new things like Spanish and blogging. 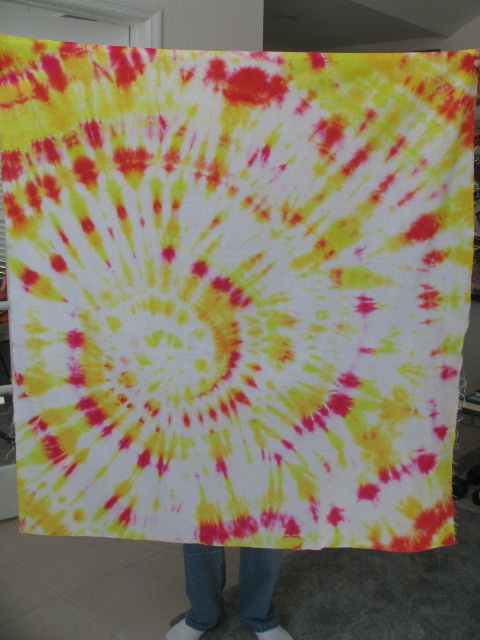 This entry was posted in hand dyes, quilting and tagged hand dyeing, quilting. Bookmark the permalink. Oh the over dyed came out great! I love the draker bits of blue in there, gives it a pop. Interesting transformation. Are you pleased? 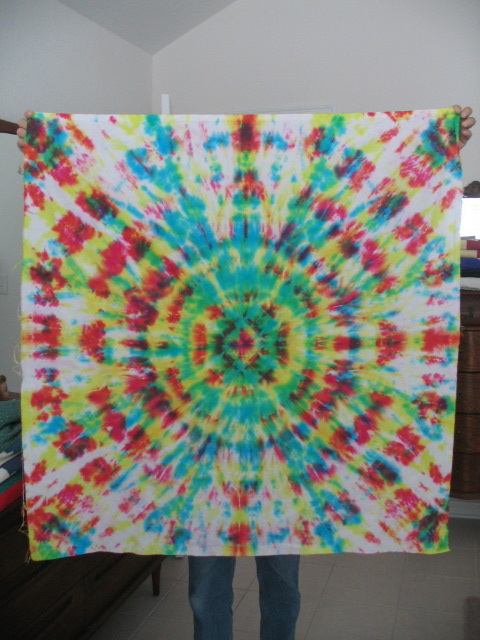 It’s pretty psychedelic! Just had a 70’s flashback! These will make truly unforgetable quilts–as beautiful coming as going. Trying to get it right the first time–aargh!